It’s been very hot here in Tokyo. This summer is hotter than usual. A lot of my friends from other countries are complaining about the summer in Japan, because it’s not only hot, but also very humid. It’s pretty hard even we are used to this weather.I don’t feel like eating heavy sweets, I prefer something fresh. This orange jelly is very fresh and very simple. I made it with lovely orange cups! It’s perfect when you have guests. It’s instagrammable, isn’t it? 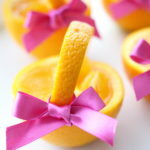 Cut 4 oranges and make orange cups. Cut the rest of 1 orange into small pieces for decoration. Add the gelatin to 1 tbsp of water and mix them together, soak it at least 15 min. Squeeze the juice from the inside parts removed from the 4 oranges. Put the squeezed orange juice, water and the sugar in a small pan, mix them together and heat it up. Remove the pan from the heat before boiling, add the soaked gelatin, mix well until incorporated. Add the lemon juice, let it cool over a bowl with ice. When it gets cold and has thickened a little, pour it into the prepared orange cups. Chill for 1 hour in the fridge. 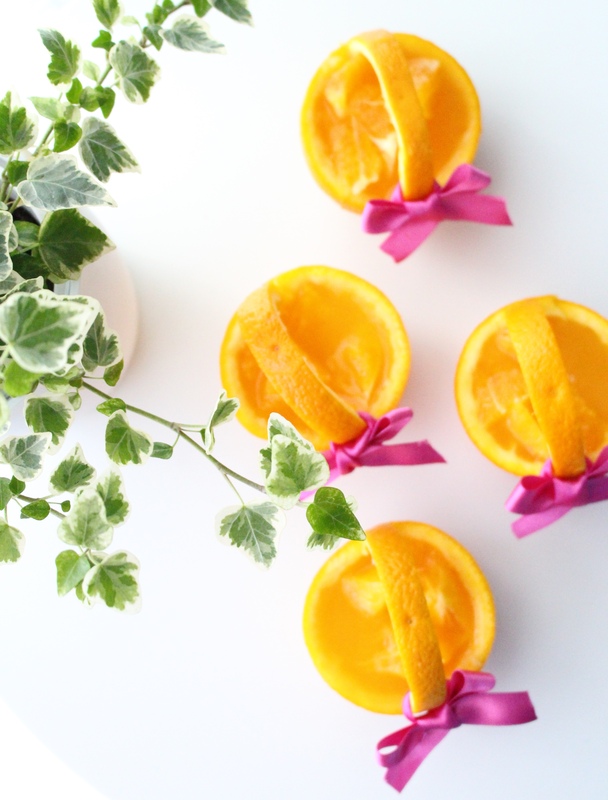 Arrange the orange pieces as decoration. The amount of gelatin is a basic recipe, it might be different depending which gelatin you use. If your jelly turns out too hard or too soft, check the instructions on the box and follow it.